Welcome to the introduction page for the Pride Junkie Comic. We have recently updated it to make it more user friendly for you. What is the Pride Junkie you ask? 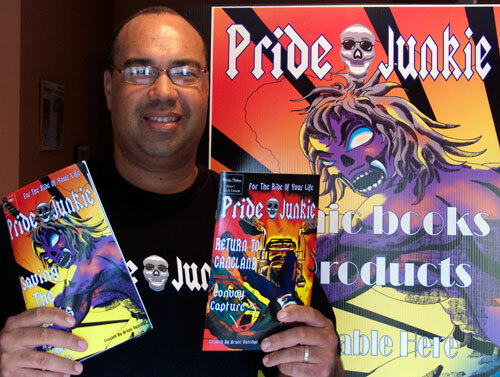 The Pride Junkie is three things, it’s a comic book hero, a comic book series, but it is also a way of life. The Pride actually stands for the following P (Passion), R (Respect), I (Integrity), D (Dignity), E (Excellence). These are values that artist I thought were important to his success in life. Using those values I created a number of comics with those values in each story. The comics were available in print form up until 2011 when the print run for issues two and three sold out. Right now the stories are available online only. The age group for the Pride Junkie Series is roughly 8-14 but kids of all ages are welcome.